Wed, Apr 17, 2019, 11:31 am SL Time, ColomboPage News Desk, Sri Lanka. 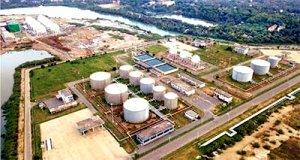 Apr 17, Colombo: The Hambantota International Port (HIP) recently awarded a tender to China's Sinopec Fuel Oil Sales Co. Limited for oil trading works and the operation and maintenance of their oil tank terminal along with associated facilities. "The partnership with Sinopec, who are one of the largest providers of bunkers worldwide, underlines our goal of becoming a bunkering hub for the entire region. Plans are already in the pipeline to expand our tank capacity in the near future," says Ray Ren, CEO of Hambantota International Port Group (HIPG), adding that HIP intends taking maximum advantage of its location, just 10 nautical miles from the main sea route connecting east and west, on which more than 31,000 vessels ply each year. Headquartered in Beijing, the Sinopec Group is the largest oil and petrochemical products supplier in China. Sinopec Fuel Oil Sales Company, covers all key ports in China's coastal areas, and operates in more than 40 overseas key ports worldwide. With its wide network and expertise, the Sinopec Fuel Oil Sales Company would promote Hambantota Port as another marine fuel supply center for their global clients, to fully utilize the advantage of the strategic location of Hambantota Port. "Due to their global networking strength, Sinopec will be in a position to offer competitive pricing, opening doors for local parties hoping to provide bunkering services. We plan to expand the port�s capacity - in fact we estimate the volume to surpass 1 Million TPA (tons per annum) in the space of five years, bringing us closer to our goal of establishing Hambantota Port as a bunkering hub in South Asia. HIP will also be looking at a number of associated services such as FW supply, sludge removals etc., which are already in the pipeline," Ray Ren, CEO of HIPG added.